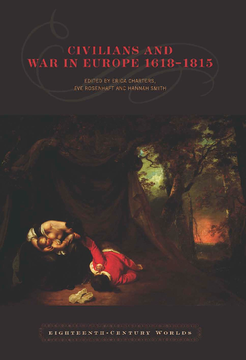 Civilians and War in Europe 1618–1815 examines the relationship between civilians and warfare from the start of the Thirty Years War to the end of the Revolutionary and Napoleonic Wars. The volume interrogates received narratives of warfare that identify the development of modern 'total' war with the French Revolutionary and Napoleonic Wars, and instead considers the continuities and transformations in warfare over the course of two hundred years. The contributors examine prisoners of war, the cultures of plunder, the tensions of billeting, and war-time atrocities throughout England, France, Spain, and the German territories. They also explore the legal practices surrounding the conduct and aftermath of war; representations of civilians, soldiers, and militias; and the philosophical underpinnings of warfare. They probe what it meant to be a civilian in territories beset by invasion and civil war or in times when ‘peace’ at home was accompanied by almost continuous military engagement abroad. Their accounts show us civilians not only as anguished sufferers, but also directly involved with war: fighting back with shocking violence, profiting from war-time needs, and negotiating for material and social redress. And they show us individuals and societies coming to terms with the moral and political challenges posed by the business of drawing lines between ‘civilians’ and ‘soldiers’. With contributors drawn from the fields of political and legal theory, literature and the visual arts, and military, political, social, and cultural history, this volume will appeal to all those with an interest in the history of warfare and the evolution of the idea of the civilian. This volume builds on recent studies of warfare that include social and cultural contexts ('new military history'). At the same time, the volume challenges traditional narratives of warfare that identify the development of modern 'total' war with the French Revolutionary and Napoleonic Wars. Instead of focusing on only the early modern period (seventeenth and eighteenth centuries) or the Revolutionary period (the later eighteenth and early nineteenth centuries), this volume examines the continuities and transformations in warfare over the course of the seventeenth, eighteenth, and early nineteenth centuries, reconsidering the nature of European warfare across two hundred years by stepping back from established categories and narratives. A superior example of an edited collection, containing essays of real importance and quality, and arranged in an illuminating way. An innovative and coherent collection of a consistently very high standard. Erica Charters is a University Lecturer in the History of Medicine, University of Oxford. Eve Rosenhaft is Professor of German Historical Studies, University of Liverpool. Hannah Smith is Tutorial Fellow and University Lecturer in History, St. Hilda’s College, University of Oxford.